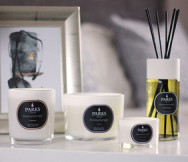 Marrying the classic aroma of sandalwood with the exotic allure of ylang ylang, our luxury Sandalwood & Ylang Ylang Candle 3 Tots Aromatherapy Gift Set brings uplifting fragrance to your space through the purest of natural wax, helping to create a warm and intimate mood. Sandalwood is an iconic scent, used by generations of perfumers for its warm, smooth and woody fragrance, which lends itself perfectly to creating a luscious and satisfying base note. Sandalwood extract is primarily produced in India, where it’s commonly used in incense products for its aromatic, smoky and lightly spiced scent. Contrasting against the silky, smooth and masculine sandalwood is ylang ylang, a potent floral extract derived from a tropical flower of the Americas. The exotic bouquet is a playful pairing with sandalwood, delivering delicate floral notes reminiscent of jasmine and gardenia. The resulting blend is curious and satisfying, and the perfect medley for creating a relaxing ambience in the bedroom, bathroom or lounge. The Sandalwood & Ylang Ylang Candle 3 Tots Gift Set contains three 80g wax votives, with a combined burn time of approximately 60 hours. Carefully crafted using the beautiful scents, these tot-sized natural wax candles are capable of filling your whole home with wonderful, long-lasting fragrance. Part of our signature Aromatherapy collection, this 3 tot gift set comes packaged in a luxury gift set, making it the ideal gift for a friend loved one, or a special treat just for you.